It never ceases to amaze me the extent that some fishers will go in order to customise their fishing gear to suit their personal requirements and the awesome results that these fishers often achieve during the process. 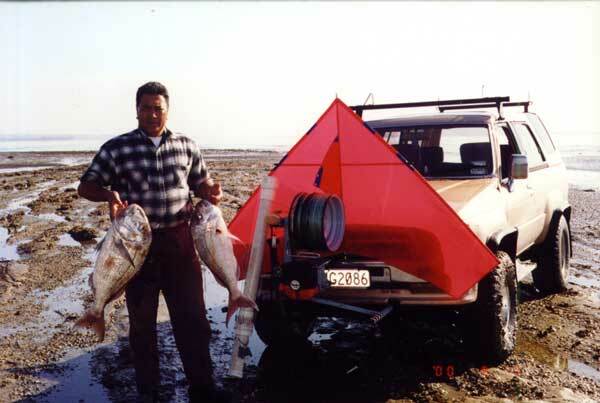 Joe Tuhimata is one such fisher and has got to be one of the keenest kitefishers I know. When Joe has spare time he wants to go kitefishing no matter what the conditions. Whether there is a howling gale or barely a breath of wind Joe has ensured that he gets the most out of his gear. Joe's rig modifications ensure he can catch fish when others fail. A great example of what can be achieved is Joe's winter catch record. In the middle of winter Joe and his kitefishing mate Willie Mangi caught a 28 lb snapper on a 1500 metre Paul's Fishing Kite Bottom Longline Rig off Uretiti Beach, this is the biggest snapper we are aware of taken by any kitefisher on the east coast. Just 10 weeks later and after converting his rig to have Dropper Rig capacity they caught a 22 lb and a 25 lb snapper from Kariotahi Beach on the west coast. Despite the fact the kitefishing club was out in force on one of their demo days and hundreds of other kitefishers were also out trying their luck, these were the two biggest fish reported on this day. Then, just last week, Joe reported he and Willie caught 15 snapper up to 5 kgs in extremely light winds from Uretiti Beach fishing his rig in the longline mode with a Mega Mouth kite. The surprising thing about his latest catch is that although there were 5 other kitefishers trying to get their rigs out Joe was the only one who not only succeeded in getting his gear out but was also the only one to catch fish on the day. No!, luck has nothing to do with Joe's success, it's all in the gear he uses. 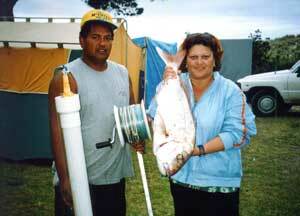 Joe Tuhimata and Willie Mangi took this great catch at Muriwai Beach, South of Rimmers Road. 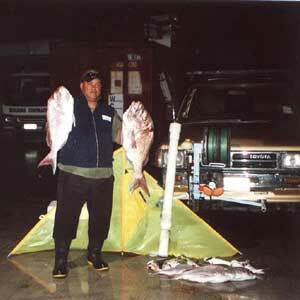 The 6 snapper weighed in at 9.5 kg, 6 kg, 4 kg, and 3 at around 2.5 kg. Several gurnard and kahawai were also caught. Joe began kitefishing, as many do, with a conventional Bottom Longline Rig and was quick to discover its potential. Joe found the standard rig worked perfectly over the clear sandy beaches of the east coast in winds of 7 knots through to around the 50 knot range but Joe wanted more. He wanted the capability to fish in even lighter winds so extended his kite range to include the Delta Force and the Mega Mouth to allow him to fish and tack in winds simply too light to fish with any other kites. This worked out great for Joe, particularly on the east coast. Joe's next alteration was to extend his standard 1000 metre longline a further 500 metres to see if fishing was more productive further offshore. This meant he needed a larger reel in order to take the extra line. He replaced his standard longline reel with the Mega Reel which comfortably held the 1500 rig plus kiteline. This did pose a slight problem though. The rig worked well, but after using it several times, and becoming convinced that he was getting better fish, Joe found that a lot more effort was required to haul it all back in. This is how the saga of Joes winch began. After several attempts and what must have been countless hours of work, Joe settled on a redundant petrol driven geared rotisserie BBQ spit which he has mounted permanently to the front of his 4WD. Joe now had the east coast well and truly sorted out. On the west coast the extra long Bottom Longline Rig worked great on the days when the surf was less than 2 metres and a moderate rip was running, but Joe wanted to be able to fish the west coast no matter how high the surf or how strong the rip. Joe's existing 100 kg Bottom Longline was simply too heavy to convert to a Dropper Rig, which was what he needed for ultimate west coast performance. Joe knew two options were now open to him. He could use two different rigs (a Dropper Rig for the west coast and a Bottom Longline for the east coast) but this meant hauling around extra gear in his 4WD to ensure he had the right gear on the day, or he could alter his existing gear so it could be used either way, this meant converting the rig into a Multi Rig. Option two was by far the best solution for Joe as he had only one winch drum. His 1500 metres of 100 kg mainline was replaced with 1500 metres of 65 kg mainline and just to be certain he could still run his 25 hook longline in complete safety on either coast his hook section was made up from 115 kg pre-stoppered nylon. Joe's rig was now capable of being fished as a 1500 metre Bottom Longline Rig ideally suited for the east coast, and as a Dropper Rig for the more challenging days on the west coast. For many kite fishers this would be the ultimate, but Joe noticed the mainline sagged into the water at around 600 metres on the west coast in lighter winds due to the extra weight of the 115 kg hook section. While this wouldn't really concern Dropper Rig fishers with 1000 metre rigs, Joe wanted to support everything clear of the water out to 1500 metres so he would have absolutely no problems with the rip and could fish safely in areas like harbour mouths or where there are one or two rocks. Joe's rig as it was the last time we saw it, no doubt he is still improving on it and we look forward to his next report. The kite in the pic is a Paul's Fishing Kites Delta Force. Now Joe already had the Delta Force, Mega Mouth, Nighthawk and Skyhook Kites and could easily use any combination of these as a Two Kite Dropper Rig with the second kite (flown on 50 metres of kiteline) connected to the mainline at the point where it sags into the water. Unfortunately, with Joe's combination of kites, if the wind got up above 15 to 20 knots the power supplied by the combination of these kites would simply be downright dangerous as Joe discovered on a trip to Kariotahi Beach. On this day Joe used a Delta Force on the outside of the rig and a Nighthawk Kite 500 metres back on the mainline. The 20 to 30 knot winds combined with the power of these two kites and the 35 kilos of fish on the line had the winch working overtime and the mainline screaming like a banshee during retrieval. For the first time ever Joe decided he needed a smaller kite and added the Super Kite to his arsenal. Joe now has every possible kitefishing scenario well and truly covered and it seems to be working well for him. Coincidentally, the rig Joe has found to be perfect for the multitude of spots he fishes throughout both coasts of the upper North Island is very similar to the Two Kite Multi Rig. As far as we know Joe hasn't used his 1500 metre system as a Dropper Rig AND a Bottom Longline at the same time as Paul and I had done while fishing Uretiti Beach in the winter of 1990 during a beach demo. In those days the maximum number of hooks allowed per line was 50. We connected a 12 hook section to the outside end of the rig, another 12 hook section was connected 250 metres further back, the Bottom Longline hook section carrying 26 hooks was a further 250 metres back and we connected a 1 kg rolling weight to the outside end of this. The results of 3 sets with this rig were not what we had expected. On each set the best fish were either mainly on the longline section or mainly on the Dropper Rig sections, never on the two combined. To this day we haven't worked out why, and with the changes in the fishing regulations, I guess we never will.